Rome (CNN)–A boat carrying as many as 500 people capsized and caught fire off the Italian island of Lampedusa, the nation's coast guard told CNN on Thursday. The official death toll stands at 93 but that did not include an estimated 20 newly discovered bodies that remain in the water, the coast guard said. Lampedusa, not far from Sicily and the closest Italian island to Africa, has become a destination for tens of thousands of refugees seeking to enter European Union countries. Deadly shipwrecks en route are common. Editor's Note: CNN Belief Blog Co-editor Eric Marrapodi was in Lampedusa last week, reporting on Muslim migration into the European Union. The "Ghost" burger at Kuma's Corner in Chicago features a "Communion wafer garnish." 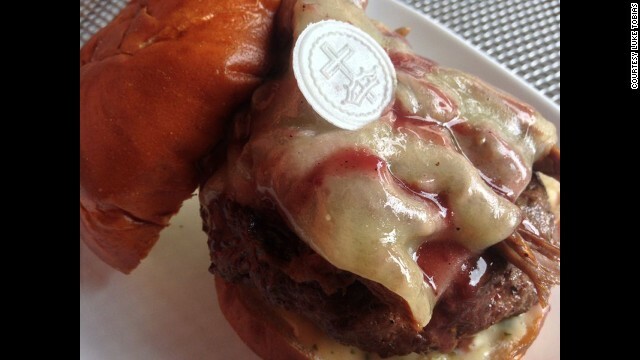 Is the 'Communion burger' in poor taste? A Chicago restaurant is pushing the boundaries of bad taste with its October Burger of the Month. Kuma's Corner, a heavy-metal themed joint with an "Eat beef; bang your head" ethos, says its new burger is an homage to Ghost, a Swedish band that performs satanic songs in Catholic clerical garb. "The Ghost" burger features a "Communion wafer garnish," a white, unleavened disc bearing the imprint of a cross and a crown.